I have had my share of tacos especially lately and I have got to say; steak is one of my favorites but only if the steak is cooked properly. Sometimes, its chewy or over cooked or even lacking flavor. 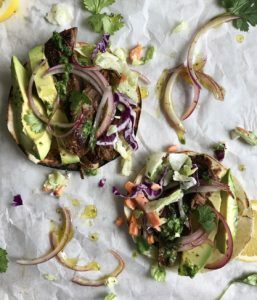 The steak in a steak taco is the most important component! It has to be spot on. It needs to be juicy, flavorful, tender, yet have a delicious crust and sear. This recipe allows for just that. Now, the toppings are almost as important because they really make the taco a taco! Its important to have various texture, so if the taco is a soft tortilla then you want to add some sort of crunch to the taco and that could be with some coleslaw which is what I did. I made a makeshift coleslaw, basically had some garden salad that I mixed with my favorite vegan dressing, Brianna’s Poppy seed dressing which also adds creaminess. By the way, I used gluten free tortillas from Aldi’s. You can use what you like. On the stove top, warm up the tortillas. 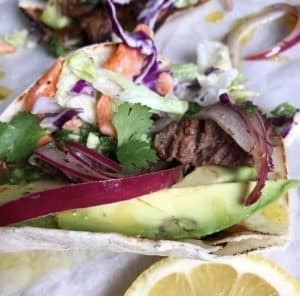 Another component, is some acidity and tang to the taco and you can do this by adding guacamole which I have a delicious recipe for! You can also make some pickled red onions for that pop or even a chimichurri sauce which I also have a recipe for. Tacos are awesome because you can really mix and match flavors and it’s almost always good!! Clean steak of some of its fat. The rest of the fat will dissolve when cooked. 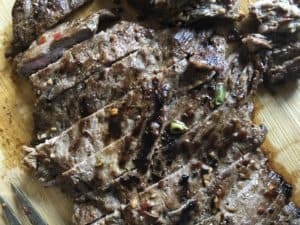 Make the marinade for the steak which is all the ingredients minus the mustard. Stir that all in a bowl. Rub the steak with the mustard. Then, add the steak in a zip lock bag and pour the marinade over it. Marinade it for 2-6 hours. 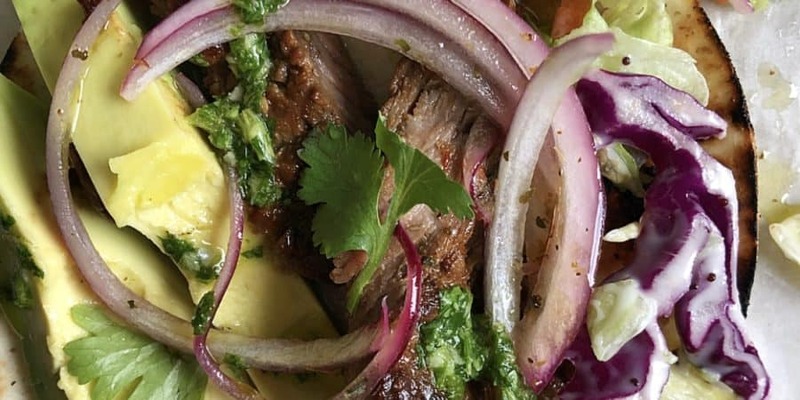 When its time to cook the steak, add coconut oil to the cast iron skillet on medium heat. Once skillet is hot enough, add the steak to the pan. You should hear a loud sizzle. Allow this to cook 5 minutes on each side. Then place steak to rest on a cool plate. Let it rest for 5 minutes before slicing. Then you want to assemble your taco. First lay the tortilla, add the sliced steak in the middle. On top, drizzle some chimi churri. Add some guacamole or avocado and of course don’t forget that creamy crunchy slaw! 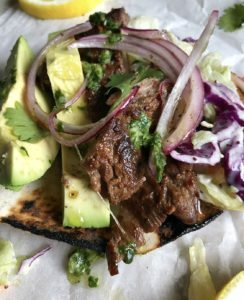 Top with some red onions and you are set to enjoy a delicious taco!